Here in my neck of the Virginia woods the rain has been far more than plentiful over the summer. The rain soaks the soil and the least wind drops any dead tree standing. In my case that means the belt of trees right above the power line that runs straight across our entire property! Sigh. Twice in the last week I been jolted out of sleep (once at 2 am in a heavy downpour and the day before yesterday in the early morning) by a huge explosion, fire somewhere out on the line, and bang – no power. 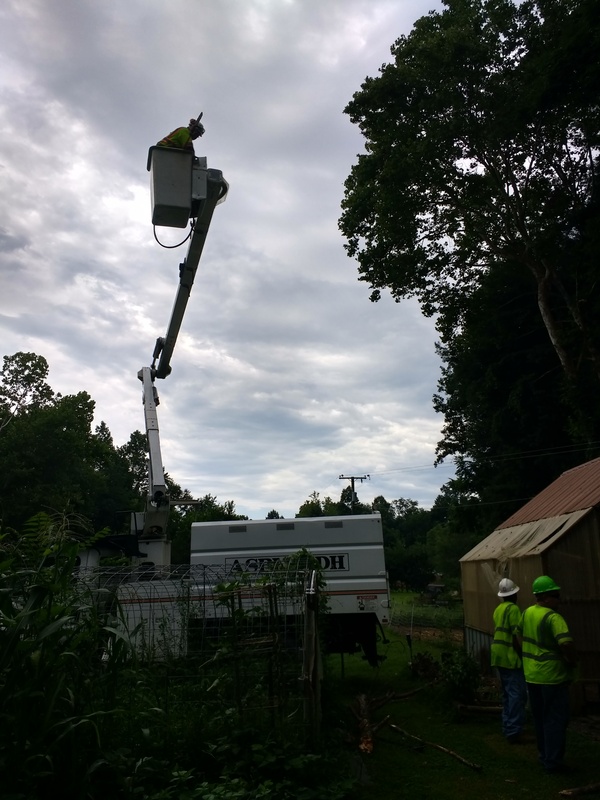 We are fortunate that our power company makes every effort to get to power outages as quickly as possible. 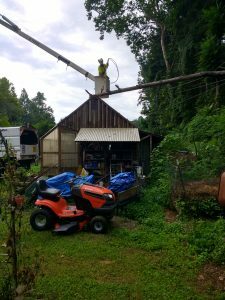 The first outage was in the pouring rain and black of night with a broken hot line that had to be reconnected and they got the power back on in 3 hours! But the outage the day before yesterday was a bit more complicated. The tree came down on the roof of the barn. So not only did they have to release the tension on the line but to cut the tree out. I gotta tell you, I am really impressed with the guy on the cherry picker. He carefully angled and shifted the bucket unit to get to the downed trunk to make a series of 6 cuts to take it out safely. The chickens were very nervous and upset over all the large trucks and noise. They kept running in and out of the small enclosed run back into the coop as if their clucking would help the job along. 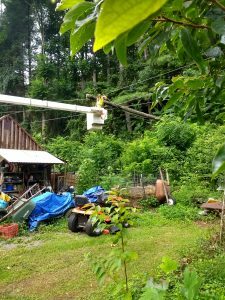 The power crew then checked along the line to remove some other threatening branches that were close to overhanging the lines. Two hours of hard work and they were gone leaving us to begin the repairs before it began to rain again. I say ‘us’ but in actuality it is my son Kierk who is the doer of great yard deeds around here! 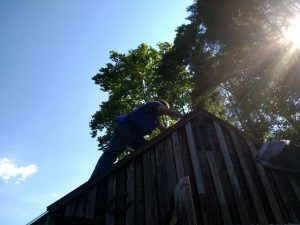 So here you can see the damage, the crew working, then Kierk nailing on the new galvanized roofing. There is still the plexi to be repaired on the front of the building.